Pull a piece of warm yumminess off this Monkey Bread Recipe. 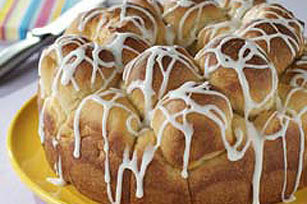 No Sunday brunch is complete without sweet, icing-drizzled Monkey Bread. Cook milk, 1/2 cup butter, sugar and salt in saucepan on low heat just until milk is warmed and butter is melted. Remove from heat; set aside. Sprinkle yeast over warm water in large bowl; stir until yeast is completely dissolved. Stir in milk mixture. Add 3 cups flour; stir until blended. Add egg; mix well. Gradually add enough of the remaining flour to form soft dough, stirring until well blended after each addition. Place in large bowl sprayed with cooking spray. Melt remaining butter; brush 1 Tbsp. onto dough. Cover with plastic wrap. Let rise in warm place 1 hour or until doubled in volume. Punch down dough; divide into 2-1/2-inch balls. Dip balls in remaining melted butter; place in layers in 10-inch tube pan. Place on baking sheet; cover with plastic wrap. Let rise in warm place 45 min. or until doubled in volume. Heat oven to 375°F. Bake, uncovered, 40 to 45 min. or until golden brown. Cool 5 min. ; remove from pan to wire rack. Cool completely. You'll know it's a special occasion when you get to enjoy a serving of this bread. To add an easy glaze, just mix 1 cup powdered sugar with 5 tsp. milk. If necessary, stir in additional 1 tsp. milk until glaze is of desired consistency. Drizzle over cooled bread. Let stand until glaze is firm. Prepare as directed, using a 10-inch fluted tube pan, reducing oven temperature to 350°F, and increasing the baking time to 50 min. to 1 hour or until golden brown. Prepare as directed, coating the dough balls lightly with KRAFT Grated Parmesan Cheese after dipping in the melted butter.